A contingent of Australian troops are to be dispatched on a training mission. Australian Prime Minister Tony Abbott is getting at least one of his wishes: Australian troops will be deployed to Iraq in the fight against ISIS. 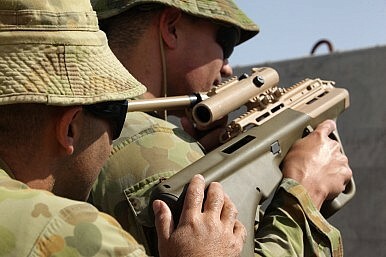 By May, at least 300 Australians will be helping to train the Iraqi army, working together with troops from New Zealand. They will be sent to Taji, outside Baghdad. This “building partner capacity training mission” was approved by the Cabinet and will run for two years, with a review at the end of the first year. In fact, there are already Australian troops in Iraq, helping train local troops. This “next phase” of Australian engagement came after Iraqi and American requests to Australia, though Abbott has never needed much arm twisting in this fight. The Australian recently reported that Abbott was keen to send Australian troops to fight ISIS single handedly, something the defense chiefs saw as utterly untenable. “This is a training mission, not a combat mission. Nevertheless, it is a mission which is necessary, because obviously in the face of the initial death cult onslaught, the Iraqi regular army melted like snow in summer. That’s been a disaster for the people of Iraq, millions of whom now live in a new dark age,” said Abbott. This was not a decision taken lightly, added the prime minister, who recently praised his New Zealand counterpart John Key’s decision to deploy troops to Iraq, despite reservations among the New Zealand public. New Zealand’s troop contributions will be smaller than Australia’s, however. Independent MP Andrew Wilkie, from Tasmania, said “500 Australian soldiers on the ground is boots on the ground. They will be on the frontline… Their lives will be at risk and you’ve got to ask why.” All the varied Western spending in Iraq in the last 12 years has “amounted to worse than nothing” and this was a “virtually unilateral decision” to go back to war and Iraq would not find its natural political level as long as it was being propped up by Western troops. Iraq’s prime minister, who has begged for Western support, obviously disagrees. Abbott seems to be framing this in two ways: as part of Australia’s international obligations, but also as a domestic security issue. Some one hundred Australians have joined ISIS and more may be supporting the group from within Australia. Quite how troops on the other side of the world will contribute to counterterrorism measures in Australia was not made fully clear by the prime minister, although Australia has recently brought in new national security measures and a tranche of anti-terror laws from the mandatory retention of citizens’ metadata by ISPs for two years to stronger moves against “hate speech” (by Muslim clerics and the like). The details of the troop increase will be finalized soon, says Abbott. While Australia's PM was embroiled in controversy, his foreign minister was visiting Afghanistan.